Today I am so excited to introduce you to a brand new project in the blogsphere: Breaking Bread! You'll read all about it below, but what you NEED to know is that we'll be #breakingbread monthly with you, baking a different recipe each month, sharing advice, and enjoying the act of breaking bread between friends. I hope you'll join us this month and bake focaccia! For the basic recipe, head on over to our hostess's site, Cake Duchess! Whoever told you baking bread at home was easy kind of lied to you! There, we said it. Bread baking is not a simple task. If it were easy, every single home baker across the world would be baking their own wonderful, crispy crusted bread with soft and moist centers every single day. After all, we live in the age of convenience. Buying a loaf of freshly baked baguette, ciabatta, whole grain or a chocolate croissant at the grocery store or bakery is accessible to so many of us. But when you have a little extra time, there is no greater satisfaction than working with your own dough and enjoying the rewards of the hard work you reaped on your kitchen counter. Breaking Bread Society was created to inspire you to bake more bread in your kitchen. We want you to bake along with us every month and break bread with your family and friends. We want to spark a bread baking passion across the nation and the world around. We know it’s not an easy task and we are here to help you along the way. Lora of Cake Duchess, our Italian baker, has a way with traditional and classic Italian breads like no other. As a young girl, she got bit with the baking bug making her first pizzas and breads with her family at their pizzeria and later at their family restaurant. Married to an Italian executive chef, her baking repertoire has grown baking alongside her husband, mother-in-law and grandmother-in-law. You can find Lora’s Cornmeal Peasant Boule featured on Fine Cooking’s Best of the Blogs. Lora is passionate about bread baking and is excited to bake and learn alongside her breaking bread bakers. Shulie of Food Wanderings, with a couple decades of baking with yeast experience and expertise, is known for her recipe development, food writing and Mediterranean and Indian cooking classes. Born to Bombay born and raised Indian parents, she comes to us from Israel by way of a DC suburb. Her food and culture writings, recipes and food photography have been showcased in nationally and internationally acclaimed publications. You can find her step by step quince stuffed challah rolls published in The Washington Post. Last but not least, Marnely of Cooking with Books, our professionally trained baker comes to us from the Caribbean island of Dominican Republic and has studied at the world-renowned Culinary Institute of America. Her baking is best known to be spontaneous and influenced by tropical flavors. She currently lives with her husband on the island of Martha’s Vineyard, where she works as a pastry chef in a private golf club, as well as develops recipes for national food brands. You can find her writing for Marcus Samuelsson and Honest Cooking. What unites us three bakers and all of you? The love of bread and a dear and growing friendship in the Breaking Bread Society! We love baking bread because people love eating real bread; delectable bread steaming hot right out of the oven. We love the discovery of a new recipe and learning new techniques about a bread recipe we may have not tried before. We are here to discover new flavors, new textures, and new ways to experience bread at the table with our friends and family, and most importantly, WITH YOU! Bake this month’s bread and post it on your blog with #BreakingBread in the title of the post by June 1, 2012. We would love to connect with you on Twitter; Tweet us at @Breaking_Bread at and tag it #BreakingBread! 'G-d, or whoever is in the skies, help me, I need dimples in the right places. and don't let your imagination run with it...I am speaking of baking!' That's the message I put out on twitter that nowadays is like my virtual Wailing Wall of sorts. Speaking of The Wailing Wall, it has a twitter account and we can tweet our wishes online while some dedicated yeshiva boy, I imagine, will print or write it down and carefully place the neatly folded pieces of paper, with our innermost hidden yearning and secrets, within the mossy ancient walls. Maybe I should have sent a message to a higher authority and place?! In the past I couldn't whip a simple foccacia into submission and these clever little dimples always eluded me. The runaway dimples, taunting and playful, made an appearance not once but twice in my recent baking focaccia adventures. Measure the water into a bowl, whisk in the yeast and 3 tablespoons of the olive oil. Measure flour and 2 teaspoons of salt in a separate bowl and stir well to combine. Add the yeast mixture to the flour and incorporate with a rubber spatula, then knead with your hands for 1 minute, until all ingredients are incorporated but dough isn't smooth. Cover with plastic wrap and let rise for an hour. I put it in the refrigerator for 4 hours though an overnight is recommended. Brush 1 1/2 tablespoons olive oil on a parchment papered cookie sheet and spread the dough, working with your fingers to about an 8x10 rectangle. I pressed the olives slightly into the dough, covered it with a kitchen towel and let it rise for 1/2 an hour. Preheat over to 425F. Make dimples with yours fingers in the risen dough, sprinkle with coarse salt and bake for 20-25 minutes until golden on top. Word to the wise: Don't snip your warm focaccia with kitchen shears. The air bubbles and pattern won't show as well. Let it cool before slicing. Don't have your dog around when you shoot either. Mine got a hold of a hunk of focaccia and spit the the olives out. Great project to get friends baking together (don't forget the chapati and pita)! Lovely looking bread as well. No worries Sarah, we are on the same wavelength! :) Yet to come. Lora @cakeduchess was the hostess bringing her Italian flair with focaccia. We'll be so fun to bake pita and chapati together as well. :) Thx for your support my friend & hope you can join the fun! Am in! Baking bread is not easy for me but whenever it comes out successfully it's like the best experience ever. Nothing like homemade. Hopefully, I can share something nice too! Super excited for this project! This looks brilliant. 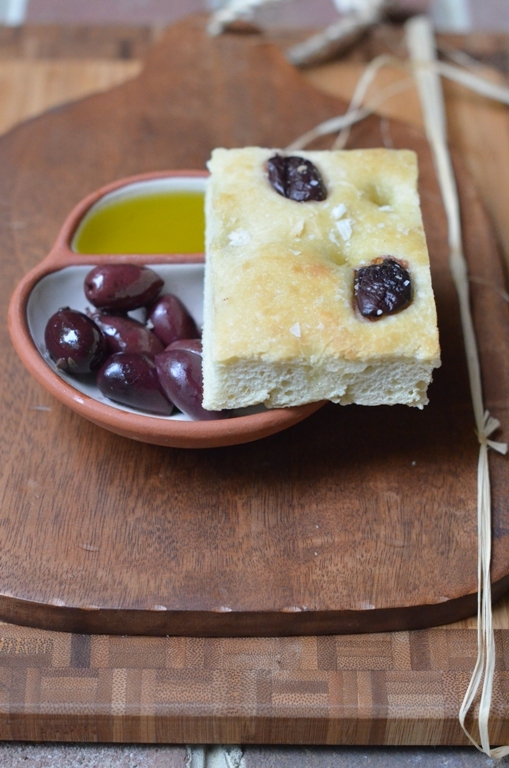 I've never made focaccia before but have always wanted to, sounds even better with the olives! Am now following your blog! TY. It's super easy to make. Delicious with the olives and I made a batch with roasted eggplants. You should give it a go and join us. That focaccia looks mighty scrumptious! Those are my favorite olives. Mine too! Thx Rosa! I hope you can join #breakingbread it would be wonderful to see your version. What a great idea for a breaking bread event! I will try my best to participate and your focaccia looks delightful! TY Sara. Please do and I bet your focaccia will be scrumptious! I know, right?! eery! yep would be nice for you to participate to overcome your fear of baking with yeast. I want to support you and bread-baking! Let's get it going! TY Lana. So true as if they got a sixth sense and are one with the dough and inherent talent. & yay so happy you are in. This will be a fantastic journey with having you for the ride. Hmm, is it just me, but I can't seem to find how much flour is needed? No, not you. Thanks for bringing it up to my attention. Fixed now. Such a great event! This is definitely going to help me in getting better at baking bread! Looking forward to participating in the event and learning a lot! 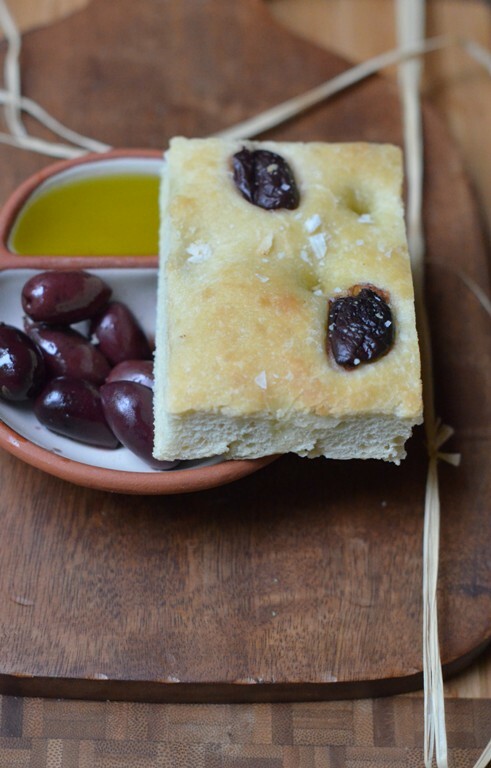 I actually love baking bread - especially pizza and focaccia so this recipe is perfect! I love all of your toppings. I look forward to breaking bread with 3 of my favorite ladies in the food blog world!! Super Jaime! So excited to have you #breakingbread with us. I know you would come up with something might scrumptious! I love this idea! I will definitely be following along and can't wait to try my hand at this gorgeous foccacia. Please do it would be wonderful to hear your results. Please read Lora's and Marnley tips for further advice. Can't wait to see your version! I love these posts you and Lora are doing! This is such a lovely loaf of focaccia! So beautiful, darling! Hey you Mister Jet setter! TY sweets! Can't wait for you join when you are back from Italy! Embrace every second and enjoy some for us. Can't wait for the recap posts! absolutely fabulous! I want a bite now! Aw I wish I could send you some Alison! Thx for dropping by and maybe baking?! Ohhh...se ve muy deliciosa es una receta perfecta amo sus ingredientes,abrazos hugs,hugs. Hi Rosita, I have to ask Marbley for a translation but am picking a word here and there. Please join us! Hi Shulie-I just linked up my Whole Wheat focaccia, and I'm so proud of you ladies, to start this great bread breaking event. I wish you a lot of success! 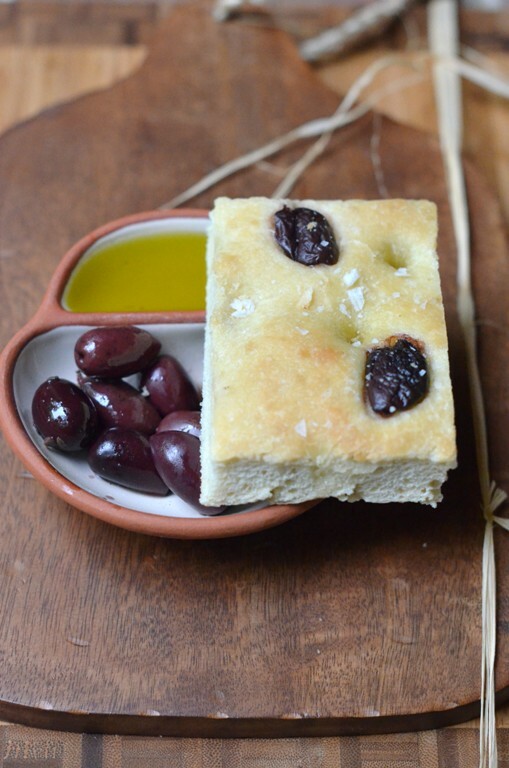 Love your Kalamata olives focaccia! BTW-the reason I commented on your "reply" section is to translate what Rosita said. Ha! I'll have to remember to keep my dog away from my bread. He wouldn't know what to do with it. Thanks so much to you and your fellow BreadBreakers for putting this together! Count me in! I look forward to baking with friends each month and will post whenever the boat is in port and I can score an internet connection. I see two dimples! Truth be told, the dimples are for the olive oil to pool in prior to baking. Most of the time, they rise up during baking, and you don't get that many, if any at all (unless you press in really deep with each dimple). Your focaccia looks great! Tiny foil balls pressed into the dough as it rises, then leaving them in while baking, would most certainly give you lots of dimples! Oil them well, though. BTW..thanks for the heads up on the Wailing Wall on Twitter. What a great idea since I can't be there to leave my wish.